Elektra Movie Video Slot Guide & Review - Casino Answers! If you’re an avid Marvel Comics fan as well as an avid gambler, there’s more than enough at Playtech casinos such as Windows Casino to keep you happy. One of the many Marvel Comics slots available there is Elektra, the Daredevil character who spawned a movie in 2005 starring Jennifer Garner.Play at this years #1 online casino for United States - Slots.LV. Bets can be made in increments of $0.01, $0.05, $0.10, $0.25, $0.50, $1, $2 and $5. You can change the bet per line to up to 10X those amounts, which means the maximum bet is $50 per line and a total bet of $1000. This is what makes Elektra great for the high rollers out there, while still allowing casual gamblers to make small bets on spins. There are four Progressive Jackpots in Playtech’s Elektra video slot: Power, Extra Power, Super Power and Ultimate Power. All four jackpots are won randomly. Any spin of any amount in the Elektra video slot can win entry to the Jackpot Game including spins with no game wins. The greater the bet you make, the better your chances are of entering the Jackpot Game. 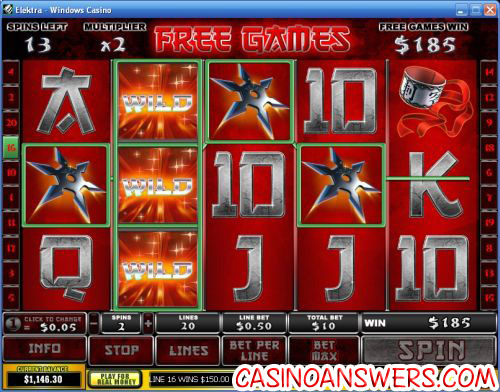 Entering the Jackpot Game will guarantee you a win of one of the four progressive jackpots. Elektra’s Jackpot Game has a 4X5 grid of 20 squares hiding different jackpot symbols. Click of the squares to reveal jackpot symbols. Your goal is to match 3 identical jackpot symbols to win that jackpot. The Jackpot Game has a reaction timer, so that if you take too long to react, the jackpot will be paid out to you automatically. Elektra’s Weapon Bonus is triggered when you get three Scatter symbols or more. 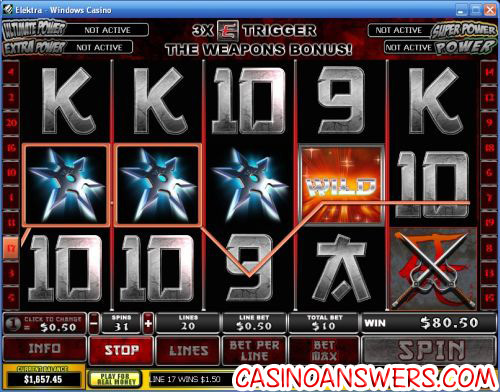 At that point, you can choose your weapon: 10 free games, 14 free games with 2X multiplier or 7 free games with 4X multiplier. Each of these options is represented by one of Elektra’s weapons. Personally, it took me what felt like 300 spins to finally activate this feature, but when I did, I ended up winning over $400. If you are a fan of the Elektra comic book character, if you enjoyed the movie or you just want to play a good 20-line video slot with stunning graphics and vibrant animations, you will want to give the Elektra video slot a try at Windows Casino! Does Elektra video slot machine have any Progressive Jackpots? Elektra has four Mystery Progressive Jackpots. Each jackpot is won randomly. Any spin you make can win, but our advice is to bet as much as you can, as that will increase your chances of winning dramatically. I’m a huge comic geek, but I’m not much of an Elektra fan. What other Marvel slots can I find at Windows Casino? Windows Casino has several different Marvel video slots available. If you’re looking for a 20-line video slot like Elektra, you might want to try Fantastic Four, Daredevil or Blade. If 25-lines are more your thing, you have the choice of Iron Man, X-Men or The Incredible Hulk. All of these Marvel video slots are based on the movie adaptations of the comic books, rather than the comic books themselves. What marvel slots are there? Where can I play marvel slots? What casinos have the Elektra Marvel Video Slot?